Confetti eggs. Jelly beans. Easter Baskets. It’s a fun time this week for the family to enjoy yummy goodies while being thankful for their blessings. 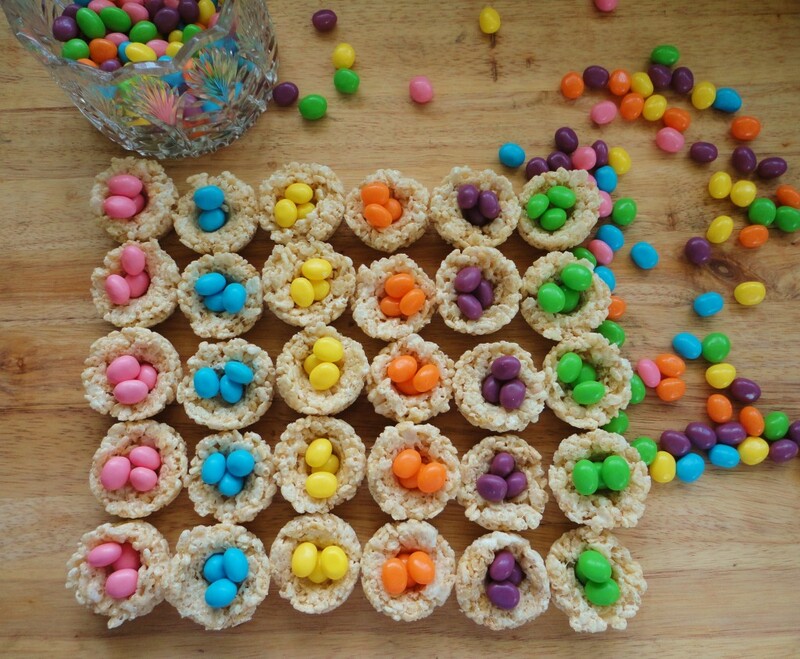 These nifty Easter egg nests are made with rice krispies. The gooey, marshmallow mixture makes a perfect dessert to take to the park for your family picnic. Best of all, they are easy to make and easier on the family budget. Plus, you can get your children involved in helping to shape them and fill them with their favorite Easter candies. For an extra sugar rush, you can add green colored shredded coconut or drizzle melted chocolate on the nests before adding the candies. 2. Quickly add the cereal. Stir until well incorporated. 3. With clean hands and/or using a spoon, scoop the mixture into a mini-muffin pan. Shape the mixture by pressing the cereal in the tin. Then using your thumb, or the end of a wooden spoon, make an indentation for the “eggs” to nest in. Cool. Remove from pans. 4. Fill cooled nests with jelly beans or chocolate eggs. You can make the nests two days ahead and then just wrap with plastic and keep them in your refrigerator until ready to use. They can lose their shape if your kitchen is too warm or has an awesome south-facing window.